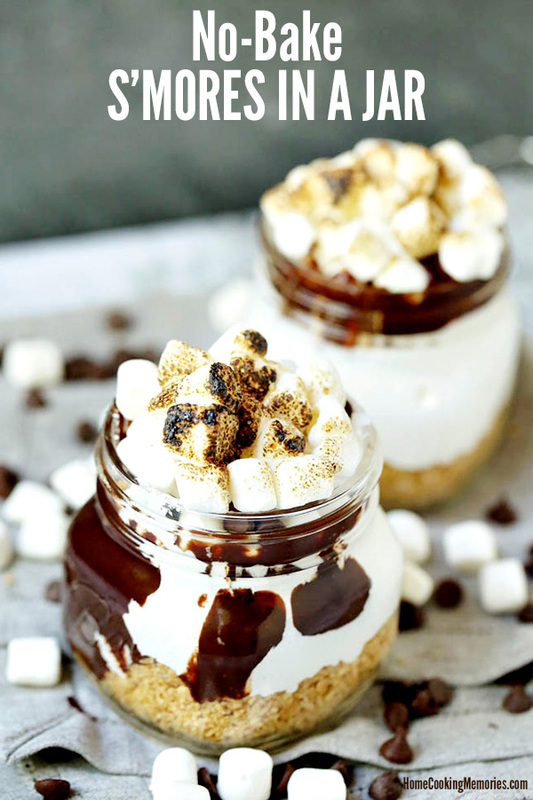 Enjoy delicious s’mores all year round with our No-Bake S’mores in a Jar recipe! Great for parties and events — serve right in the mason jar! This post contains affiliate links for your convenience. We receive a commission if purchases are made through our links to retailers. Click here to read our full disclosure policy. It should come as no surprise that I am absolutely crazy about s’mores desserts! A couple times a year (4th of July, for sure), I get to indulge in traditional s’mores, enjoyed outside with the grill or over an open fire. But during the rest of the year? I’m always looking for a good excuse to have s’mores. 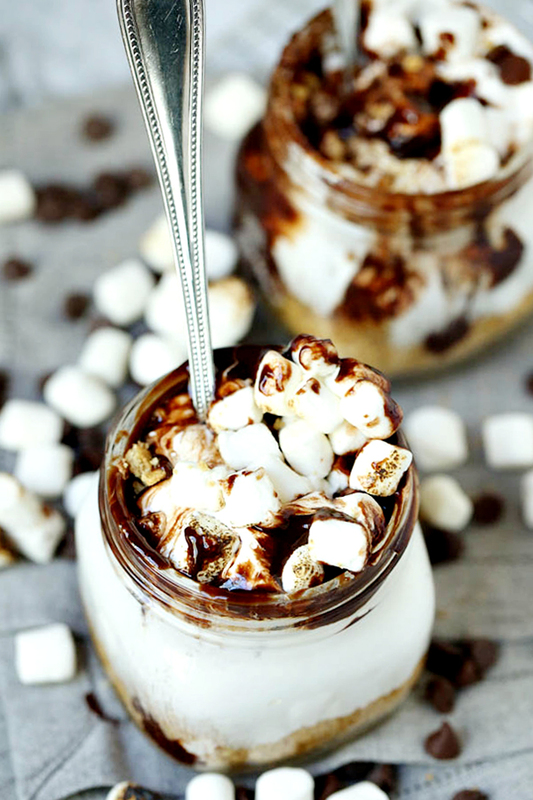 Today we’re adding to that collection by sharing a S’mores in a Jar recipe. 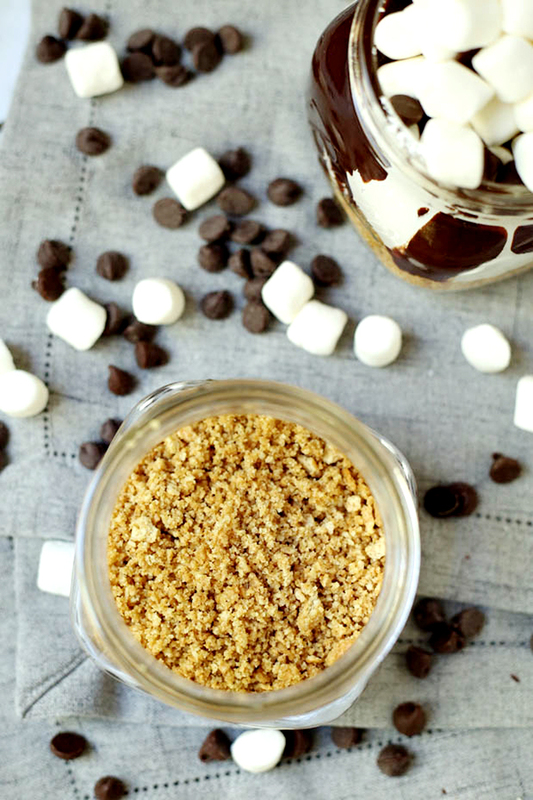 These are super simple to make and include all the key flavors that you would expect in a s’mores dessert: graham cracker crumbs, marshmallow creme & mini marshmallows, plus a homemade chocolate ganache. 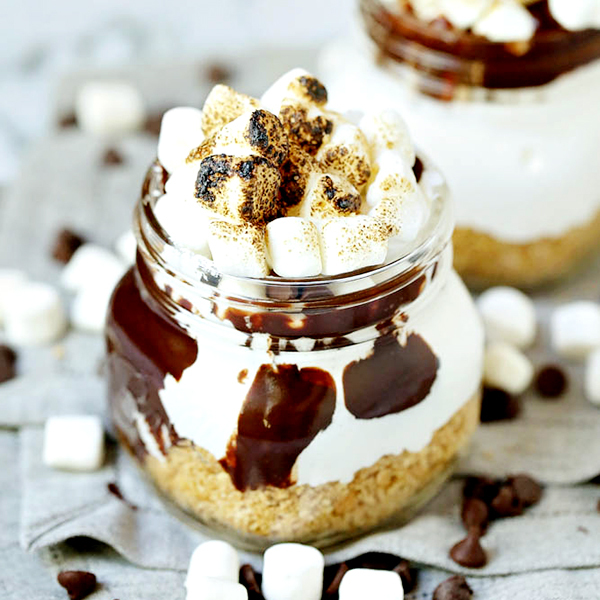 One of the things I also really like about this s’mores recipe is that they are a dessert in a jar. You assemble the ingredients right into a mason jar and you serve it in the jar too. For this recipe, we used Ball 16-ounce wide mouth mason jars. 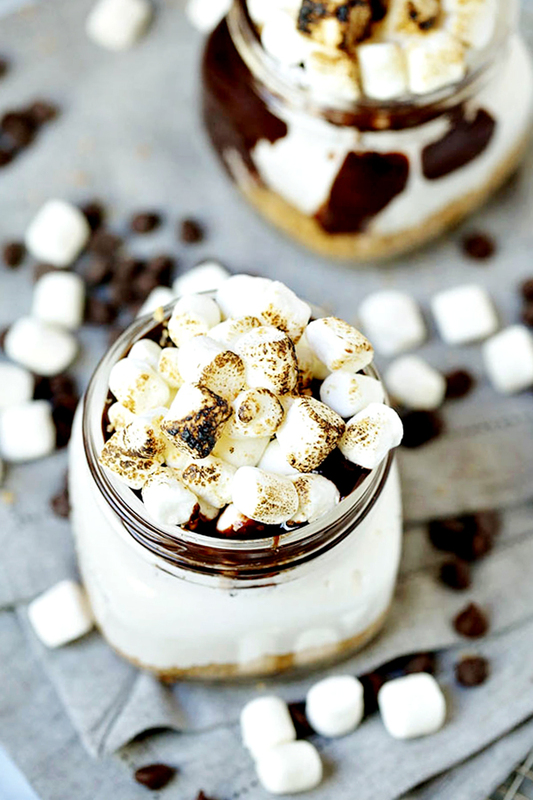 While we like this size for this No-Bake S’mores in a Jar recipe, you don’t have to use this size. You could certainly use a different size that you have on hand, including a smaller jar (such as 8-ounce mason jars and 4-ounce mason jars). If you do use a different jar, you’ll have to adjust the amount that you place for each layer. I know that when some of you hear “chocolate ganache”, you might be a bit concerned that this is complicated. But, have no fear. It’s actually quite simple to make and you’ll really enjoy it in this dessert. The first step to making your S’mores in a Jar recipe is to make your chocolate ganache. This is done by heating heavy whipping cream over medium-high heat until it starts to bubble. Add your chocolate chips, turn the heat down way low, and whisk until all the chocolate chips have melted and you have a thick chocolate ganache. Allow the ganache to cool and thicken and it’s ready to be used in this recipe. After you have made the chocolate ganache, place about 1/2 cup of graham cracker crumbs in the bottle of your jar. For the graham cracker crumbs, you can buy a box of graham cracker crumbs or buy the actual graham crackers and crush them yourself. Pat the crumbs down a bit in your jar. On top of the graham cracker crumbs, add about 1/2 cup of marshmallow creme (also called marshmallow fluff). This is sticky stuff, so plop it in there and try to spread it out a bit over the graham cracker crumbs — it doesn’t have to be perfect. After adding the marshmallow creme, you’re ready to add your homemade chocolate ganache layer. The ganache is then topped with mini marshmallows and, if you wish, a sprinkle of chocolate chips. NOTE: If you make the chocolate ganache in advance and it’s been refrigerated, we recommend letting it come to room temperature before using. Now, what’s one of the best things about s’mores? TOASTED MARSHMALLOWS!! To make this the ultimate s’mores dessert, we recommend using a kitchen torch and toasting those mini marshmallows that you placed on top. Don’t have a kitchen torch? You could also place the jars on a baking sheet and place them under the broiler on your stove. But keep a close watch — you don’t want them to get too burned! You don’t have to toast the marshmallows, but we recommend you do. Not only does toasted marshmallows taste the best, but they make this marshmallow dessert look great. 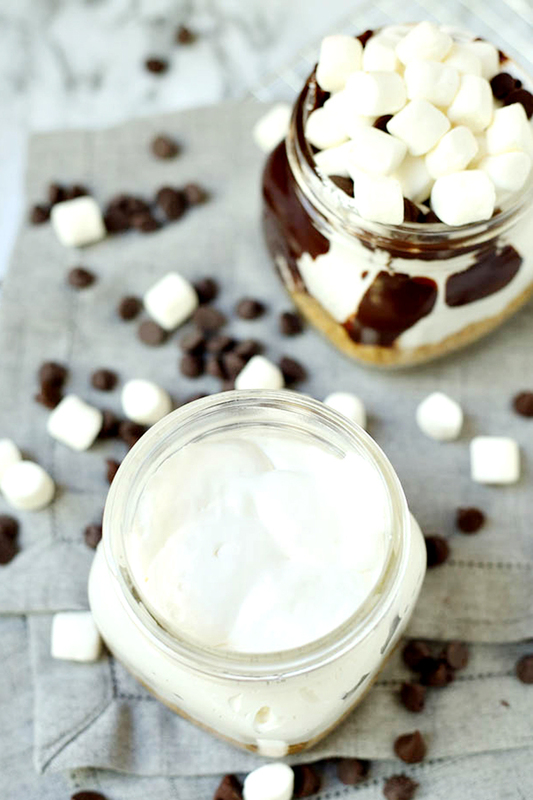 Since this is a no-bake s’mores in a jar recipe, it’s now ready to serve! Grab a spoon and dig in! If you are going to make these for a party or event, you might be wondering how far in advance can you make these. We recommend assembling these the day of your event, but you can make your chocolate ganache even a week beforehand. You’ll want to let it come to room temperature before spooning it into your jar. 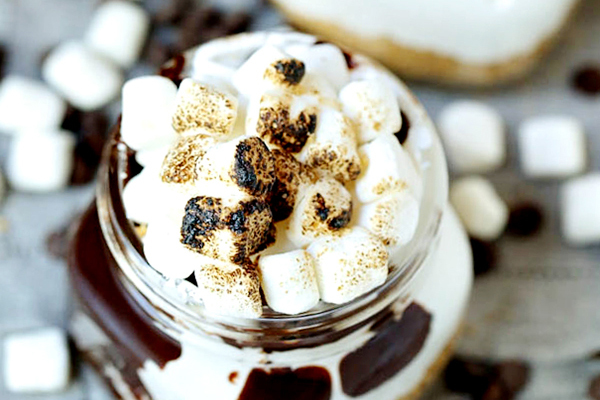 Watch our No-Bake S’mores in a Jar Recipe Video! Here’s the full recipe, ready for you to print! If you like this recipe, we’d love for you to share it on Facebook with your friends and family or for you to pin it on Pinterest. Thank you for your support and we hope you enjoy this delicious dessert! In a small saucepan, heat heavy cream over medium-high heat until it starts to bubble. Quickly add chocolate chips, turn heat down to low, and whisk quickly until you have a thick, even textured ganache. Set aside to cool and thicken. Brown the tops of your mini marshmallows with a cooking torch, and serve!